With a dash of changes the K-drama remake of the movie The Beauty Inside reverses the genders around and adds a longer period between switches in order to make it work on the small screen. 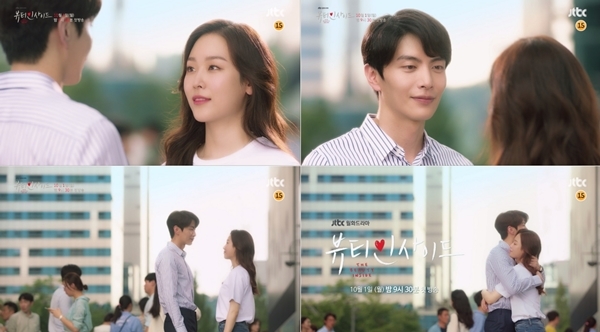 The first teaser unveils the emotionally dreamy and visually jarring romance between top actress Seo Hyun Jin who changes forms once a month and her love interest played by Lee Min Ki who suffers face blindness and someone only recognizes Seo Hyun Jin’s original face. It’s always weird to see the form change to a small child, everything else is fine but seeing Lee Min Ki smile lovingly at a little kid is still discomfiting to see even if we know it’s just a shape-shifted form of Seo Hyun Jin. She looks so pretty for this drama and he’s traded the socially awkward nerd from This Life is Our First for a clean cut handsome professional type, matching up very well in visuals from height to emotional connection.